Teräväinen has picked up the pace this season and with 25 points he has the most points from his team’s defenders. The defenceman didn’t get points against Dubuque Fighting Saints but he saw a lot of ice time in the power play. The best part of his game is his offensive talent. His passing is really solid and his passes are very crisp and precise. He is also very confident with the puck even in tight spaces and he is able to carry the puck with poise. He is also very well aware when he should join the rush and when he should stay behind. However I would like to see better top speed from him and that area clearly needs improvement, but his skating still looks pretty smooth. The defender has some problems in the own end, especially in front of the net because his physical play still needs a lot of improvement. However he doesn’t give too much room for the opponents and his gap control is pretty good. And even though he isn’t very physical player yet, he is very efficient in defending with his stick. Teräväinen was on ice during three goals from USA. Twice he didn’t break the pass and he lost his man at the crucial moment. On the third goal, which was shorthanded goal for USA, Teräväinen tried to defend the man instead of securing the passing lane and Logan Cockerill managed to pass the puck through Teräväinen and that caused breakaway for USA. These goals highlighted that he needs to improve his defensive awareness. However defenceman has some interesting qualities. His puck handling skills are good, he knows how to carry the puck and his first pass is usually precise. Teräväinen is bit small for defender and he has a lot of frame to fill up. Due to that defender loses board battles and one-on-ones often, but he has will to try to play more physical game too. 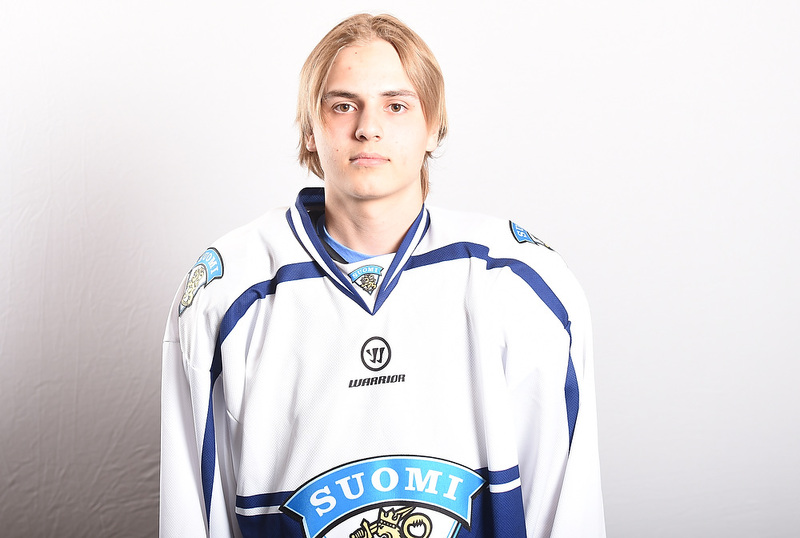 His top speed isn’t as good as it could be but Teräväinen skates smoothly, he is agile and he accelerates quickly. His defensive play with the stick is pretty good too. Teräväinen showed that he is a quality puck-moving and smooth skating defenceman for his league. He hasn’t been able to collect much points this season but offensive production will come eventually if he continues his impressive game with the puck. Defensively he occasionally gets into trouble while battling against bigger players and losing one such board battle caused goal for Tri-City Storm. However Teräväinen usually manages well defensively with his active play with stick. Defender showed will to join offensive rushes but sometimes he seemed to be too eager to create offense at the expense of defensive game. He could also improve his shot in order to be more effective on powerplay. Teräväinen’s game really stood out in the game as he was making solid plays in all three zones. His game looked much improved from last season, he had plenty of shots and showed fluid skating in all directions. He scored the game-winning goal with a quick wrist shot on the power play. He anticipated plays well, he was reliable and made strong plays with the puck.